The future of the world's cities is not the car. 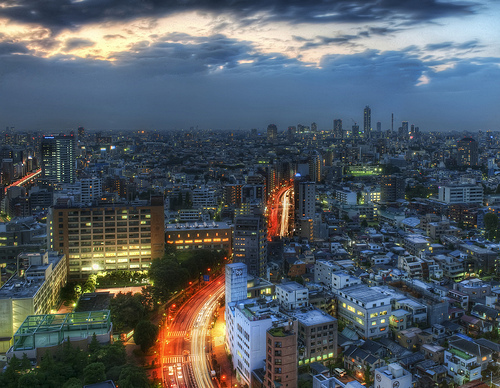 Photo of Tokyo by Trey Ratcliff. Establishing excellent mass transit and walkable, livable cities is another part of encouraging travel via public transit, walking and biking. And as Nicolae Duduta, Transport Research Analyst at EMBARQ (the producer of this blog) pointed out, “Europe has similar rates of car ownership as the U.S. but the car is used less often.” For example, a small portion of Europeans relative to Americans use their cars to get to work everyday. Vehicle Miles Traveled (VMT) tends to be a more accurate indicator of how far city residents are actually traveling to get places. As we wrote, “It is possible for public transportation to thrive, even as there are more autos on the road” but it depends on “the cost and ease of car ownership and the quality and availability of substitute options.” In Europe, parts of Asia and even parts of the U.S., “auto ownership may be widespread [but] operating costs (specifically fuel prices, parking, and in some areas congestion pricing) are higher, parking is not as guaranteed and driving alternatives are more prevalent and competitive with driving.” These incentives for public transit and the availability of alternative options can actually reduce VMT. Households or people that own cars do not perceive driving as the only way of getting around but rather as one option among a menu of choices. People will likely choose the most appropriate and convenient mode for a given trip. Exemplifying the importance of dense cities organized around transit that discourage sprawl, in the U.S., the modal share of individual car use for cities decreased ever so slightly from 2000 to 2009. But this change occurred only in older and denser cities. But still, according to the “Megacities on the Move” report, vehicle ownership currently stands at one billion cars and this figure is expected to grow to two billion in the next few decades. Smart growth patterns along with policy are needed to create attractive alternatives to driving. Allocation of road and parking space for public space and public transit alternatives are important. For example, bus rapid transit (BRT) uses existing road infrastructure for buses that run on dedicated lanes. This component of BRT makes the systems cheaper to implement, but also takes space away from individual vehicles and uses it for mass transit. If usage of BRT is high, this frees up more road space for cars. 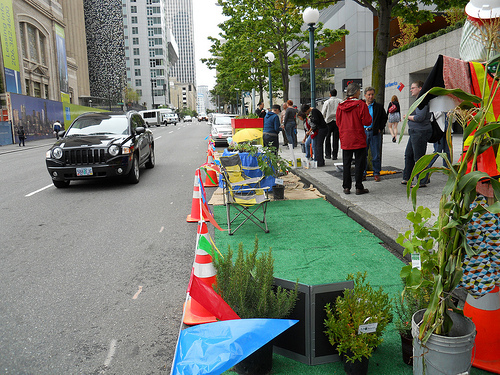 Re-envisioning space allotted to cars in urban settings through PARK(ing) day. Photo by Allie Gerlach. The annual Park(ing) Day seeks to inspire people in cities to reconsider the amount of public space allotted to individual vehicles. For a day parking spots are transformed into temporary parks for the public good. Making driving more costly and difficult has also been effective in a number of cities. Quito, the capital city of Ecuador and a city of 2.1 million residents, has seen a rapid rise in car ownership but has also created incentives for residents not to drive. The city has a BRT system with exclusive lanes that transport nearly a half a million people. In addition to mass transit, Quito has a comprehensive policy to reduce congestion in the city. Parking is restricted in some urban areas, lanes have been converted to exclusive biking corridors, and the city has occasional car-free days. Plus, in 2010 Quito became the first city in Ecuador to restrict the number of vehicles coming into the city during peak hours on weekdays, following the example of São Paulo, Brazil and Bogotá, Colombia. The policy is called Pico y Placa. (“Pico” for peak and “placa” for license plate number.) During rush hours, certain license plate numbers are restricted, which means car owners are not allowed to have their cars on the road one day a week. Traffic during peak times has fallen by as much as 30 percent, the ultimate goal being to remove as many as 80,000 private cars off Quito’s streets. The result of the program has also been car-sharing behavior as people combine trips with neighbors whose licenses are not restricted. (For more information on these policies and initiatives in other Latin American cities, check out the Latin American City Index [pdf]). The city of Lyon in central France has managed to develop an integrated multi-modal transportation system, including subway, light rail, BRT, and bike sharing. Transports en Commun de Lyon (TCL), Lyon’s transportation agency, manages the entire public transportation system, and this helps improve transfers and coordinate schedules between different modes. Riders can use the same fare card to transfer from bus to light rail to subway. The city has also redesigned streets to make them more pedestrian friendly and expanded its transit network. 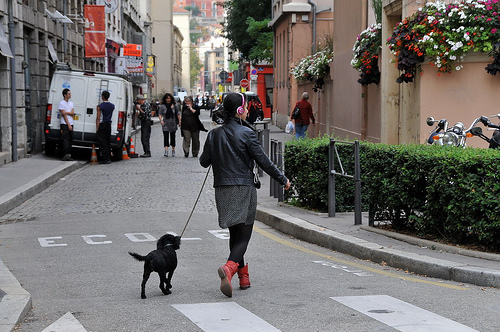 The streets of Lyon are not dominated by the car but incorporate multi-modal use. Photo by FaceMEPLS. The issue is not car ownership itself but how often and how many miles residents travel, which can only be reduced through comprehensive planning, viable alternatives and policies that encourage the use of alternative modes of transit. Engineers, planners and designers have significant power to promote dense growth in existing cities along with sustainable transportation.